Quick Tip–Creating Distribution Groups from a CSV file using Powershell for a LAB environment…. In a previous article, I provided a Powershell script which could be used to create a number of users for use within a Lab (test environment). Moving on from that, I recently started thinking about other elements of Exchange that are typically very repetitive to perform, but are also needed within an LAB infrastructure – one such example is Distribution Groups. Download both the Powershell script and the Sample CSV file to your Exchange LAB server. You have the option of editing the CSV file before you use it – there are 33 pre-defined sample distribution groups – however you can add more should you wish. 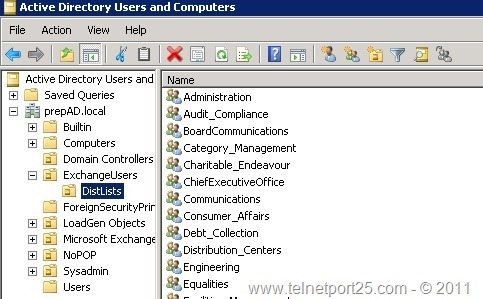 You can include spaces in the “Name” Column to form the Display Name for the Distribution List, however it is recommended that you do not include spaces in the “samAccountName” column (as this forms both the samAccountName and the Alias for the Distribution list). Furthermore within the script you will need to modify the destination OU location within AD where the script places each of the distribution lists. In order to execute the script, open an Exchange Management Shell and navigate to the location where you have downloaded the script file to. When the Countdown has completed – the script will then create the Distribution Groups – see below. That concludes this Quick Tip – I hope that someone finds this useful. Sorry James, for some reason I had thought that I put the requirements in the article – obvisouly not from reviewing it. Ok, in order to use the script it should be downloaded and executed on an Exchange Server which has Powershell v.2. 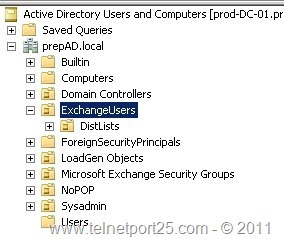 Powershell 2 for the Get-Organizational unit and the Exchange Management shell for the New-Distribution group. Dear sir, it’s great. really it’s easy ot make 1000 mailbox at a time. thank you so mcuh. please give any tips, how to make easy life in Exchange. thank you once again. 1: Create DLs using CSV file. 2: Should have option to specity doamin and OU, defining admin/owner’s name in Notes field, add members to DL, assign rights to owners to modify the membership. Basically we are planning to delegate this task to our service desk staff. any idea to include owener / co-owner details in CSV ? so that it will reflect in AD? I know this is an old thread but I am trying my luck here.